‘tRshhNA’ is thirst. Desire is a thirst. When thirst arises, the tongue craves for drinking water; so also desire is the thirst for the enjoyment of sensual pleasures. Only when it is gone you can get NirvANa – that was the great discovery of the Buddha, say the Buddhistic texts. Whatever religion there is among civilized society it does not fail to give importance to the eradication of desires. Our Acharya also has given great importance to Vairaagya that eradicates desires. In his work *aparokshhAnubhUti*, when he refers to the SAdhanA regimen, he calls it (shloka 3) the *vairaagyAdi chatushhTayaM* -- ‘the four parts consisting of VairaagyaM etc.’, thus mentioning VairaagyaM as the chief part. This is the Acharya’s definition of VairaagyaM in Viveka-chUDAmaNi (shloka 21). ‘That is indeed VairaagyaM’, says he dramatically! ‘What is?’. Revulsion from objects of enjoyment by this human body, all the way from those things seen, heard, etc. 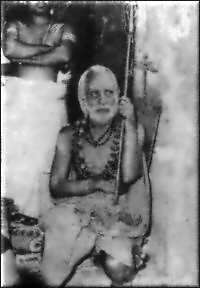 in this human world to those objects of enjoyment in Brahma-loka – that is VairaagyaM. “jugupsA” means the feeling of disgust that causes one to reject it. An alternative reading is ‘jihAsA’. The meaning is the same. Once jnAna has been reached, then one feels love towards everything. There is no question of revulsion then. Because, then none of the objects whether bad or tempting, will affect him. In stages that precede that, it is not so. All objects of enjoyment of pleasure that cause us to slip down have to be discarded with distaste -- only then one can save our Self. For the later sprouting of the personality of Love, one has to create for oneself this feeling of aversion!